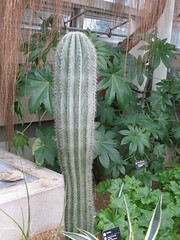 The Shoenberg Temperate House was dedicated in March 1990 after almost two years of construction. This building replaced the 1913 Mediterranean House on a site just north of the Climatron® geodesic dome conservatory. The new facility was given by the Trustees of the Shoenberg Foundation, Inc. The Shoenberg Temperate House is glazed with the same low-emissivity, energy-efficient glass used in the Climatron, and its southward roof slope allows maximum penetration of solar rays. A computerized climate control system aims to maintain the Temperate House at temperatures between 40 and 90 degrees. 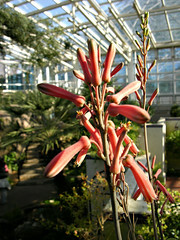 With 8,900 square feet of space, the Shoenberg Temperate House roughly doubles the exhibit capacity of its predecessor. It emphasizes displays of warm temperate-zone species requiring special protection from St. Louis winters. The largest portion of the house features species from five widely separated regions of the world known for their “Mediterranean” climate, chiefly characterized by warm, dry summers and cool, moist winters: coastal California, the central coast of Chile, the Mediterranean Sea basin, the Cape region of South Africa, and southern and southwestern Australia. Another portion of the Temperate House features plants found in the southeastern United States and the warm, temperate areas of Japan, China and Korea. 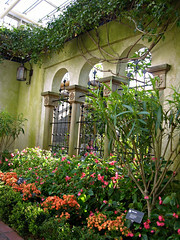 A Moorish walled garden reflecting major elements in the history of formal design. Important economic plants, such as olives, figs, carob, grapes and cork oak. “Plants of the Bible” area. Plants from the island of Madagascar. Riparian plants, adapted to survive at the edge of watercourses such as rivers and streams. A large bog display of carnivorous plants from the southeastern U.S., including pitcher plants, flytraps, butterworts and sundews. An additional element of interest is an antique portico overlooking the Moorish garden, once the facade of St. Leo’s School in St. Louis. This portico was the work of the sons of George I. Barnett, a local 19th century architect who designed several historical buildings on the Garden's grounds. The Shoenberg Temperate House was designed by the Christner Partnership, Inc. of St. Louis. Interior displays were designed by Environmental Planning and Design of Pittsburgh, Penn.